The simple act of singing can evoke joy and connection. It bridges the differences between people and creates a sense of unity. This is the core idea behind the Timor Leste Belun Malu Choirs Project, a musical cultural exchange program between the Bega Valley and the Natarbora region of Timor Leste where in Tetun , Belun Malu means “friendship“. 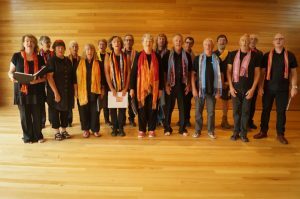 This Belun Malu Choir is from all over South East NSW from Kiah to Bermagui. Conducted by David Francis, it has been purposely formed to travel to, and perform in Timor Leste in July 2019. Another Belun Malu Choir from Timor Leste will come to Australia in the autumn of 2020.